The bus stop in Taba wasn't so much a bus stop as it was a quasi-desolate place where the dry winds of the North African desert swirl and flies, dust, and people coalesce to contemplate their next destination. A friendly middle-aged man whose proud smile revealed profoundly anomalous dentition sat hunched over a tattered table presumably selling tickets and dispensing information. My Arabic commensurately as poor as his English we eventually arrived at one of those universal understandings through a series of truncated words and gesticulations. "I G-O T-O C-A-I-R-O", I proclaimed as I pointed enthusiastically to the West. I spoke loudly and slowly and enunciated diligently in English as did he did in Arabic, as if by some epiphanous linguistic principle slowing the velocity and raising the volumes of our voices could somehow impart a spontaneous understanding of our respective languages to each other. After paying the gentleman I sat down with my backpack on the gravel to wait. While the point was made that I wanted to go to Cairo, minor details about which bus to take and when it arrived were somehow hopelessly lost in translation. After a period of time an aging bus arrived and I boarded less than confident that it would lead me to the splendorous gates of Cairo (it did). For 8 hours the bus wound its way through the barren Sinai Peninsula, the only sign of man's presence were the burnt hulls of Russian made tanks destroyed in the 67' war that lay strew on the side of the highway every now and then. Eventually signs of civilization emerged on the horizon. Cairo is a robust beast beaming with 14 million citizens and eclectic thoroughfares and back alley markets that light up at night when the punishing sun disappears and people pour onto the streets. The chaos of Cairo is actually quite exhilarating. The roads are packed with charmingly old Peugeots and Ladas who engines have long seen better days. A ride in a taxi is cheap and more exciting than a roller coaster. The legions of intrepid taxi drivers rage through the avenues and dizzying roundabouts like angry ants spilling out of a freshly disturbed mound. Here lanes exist only in a purely abstract and theoretical sense. Like some kind of unchoreographed automotive ballet, drivers weave in and our traffic darting and zipping in front of each other as tempers flair. The streets are lined with airy outdoor cafes where masses of people huddle around small televisions with dubious degrees of reception to view live soccer matches as they smoke hookahs and drink coffee. Cairo is probably much safer than any big U.S. city at night. Police in white uniforms seemingly stand guard on every corner brandishing large kalashnikov machine guns, a menacing deterrent to aspiring criminals. Walking around the streets it is hard not notice that a large percentage of men have a distinct area of increased pigmentation on their forehead, almost like a scar. I'm told these are the pious ones, the scars developing over the years when they prostrate to their knees and bow their heads scuffing the floor while praying to Allah four times a day. While many of Egypt's treasures of antiquity have been plundered by greedy colonialists over the centuries, Cairo's Egyptian Museum is still an amazing stop. Probably the most impressive artifact is King Tut's 24-pound solid gold death mast. The Egyptian Museum sits near the banks of the serene Nile River. The Nile stretches wide and is lined with greenery spread amongst random buildings. Perhaps there is no better way to enjoy the river than sailing its sacred waters on a felucca sailboat at dusk. The felucca's supple wooden mast bent back and forth slightly as the sail tugged in the light breeze while the tired sun dropped over the west bank of the river. The sun slowly evaporated into the horizon and eventually all that was left was the dark silhouette of the palms set against the crimson sky and the red glow of the water. Back in the 14th century the Mamluk sultans began constructing a vast necropolis beyond the city gates. It was here they buried their dead and built extensive tombs and mausoleums. Over the centuries the place grew and become known as the northern cemetery. 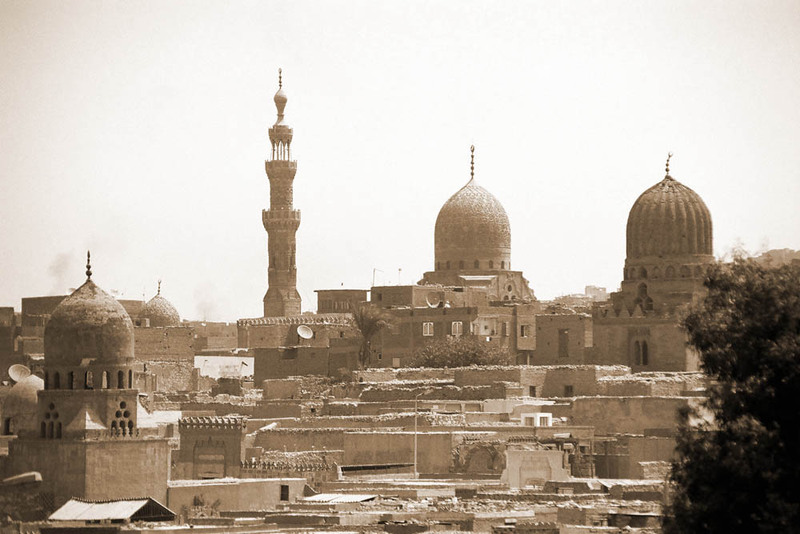 Eventually Cairo's poor and forgotten began squatting in the uninhabited mausoleums. Today's inhabitants live nestled amongst the deceased, hence the name The City of the Dead. The city is filled with crumbling tombs and decadent dwellings where entire families go about their lives. Ghostly mosques sprout ominously above the macabre city overlooking the multitude of tiny alleyways and narrow footpaths. 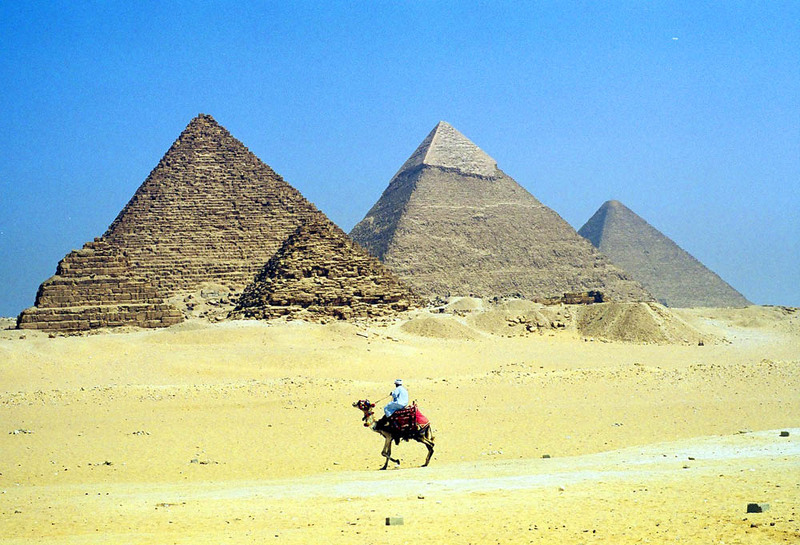 What to say about the great Pyramids of Giza? Built approximately 2300 B.C., they stand as the only extant remnant of the 7 wonders of the ancient world. Until the turn of the 20th century they remained the tallest man made structure in the world. Giza sits on a plateau just outside Cairo where 3 giant pyramids sit among 6 lesser pyramids and the sphinx. The 3 main pyramids are each constructed of 2 million 2.5-ton blocks. Khufu is the largest of the three big pyramids and is best experienced by crawling inside through a 4 foot by 4 foot narrow shaft that leads to the tomb chamber in the center. Birqash is Egypt's largest camel market, a stockyards of the Middle East I suppose. Throughout my travels I have come to realize that sometimes the most surreal part of arriving at a place is in the journey there, my trip to Birqash was no exception. At this point the language barrier was a given as it is a rare Egyptian that speaks English. I took a cab to a small hamlet outside Cairo called Imbaba that my lonely planet book explained I could find my way to Birqash by looking for some random cafe with some random sign and then asking around for directions to a series of minibuses to Birqash. Eventually through a succession of crowded minibuses I arrived at a minibus setting out for Birqash. 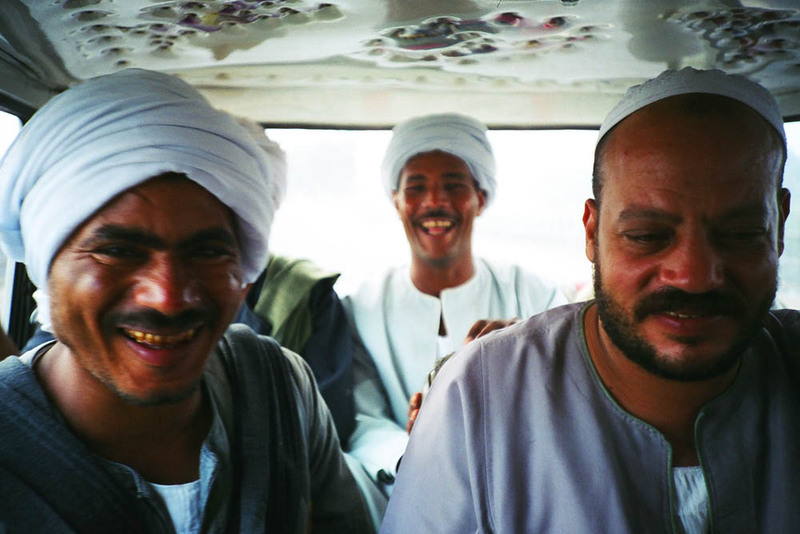 The minibus was filled to the brim with camel herders heading North to the market. They all wore white kaffiyehs on their heads and long colorful robes in various shades of pastel. They were friendly and laughed as I squeezed onto the minibus. The bus passed tiny cities of squalor with cesspools and trash lining the streets. At some point a man boarded the minibus that spoke some broken English. He was from Sudan and talked to me about the camel trade. He admired the camel for its durability, after all they can endure the dry heat of the desert for 3 month at a time without water. The camels arrive in Birqash after a 40-day trek across the Sahara desert from Northern Sudan, some even come from as far away as Somalia. Eventually I ended up at the market. The market was fascinating. Basically the place is a series of massive stables where the camels are separated by age. Apparently these camels sell for $400-$800 US. Small circles of herders stand leaning on their shepherd's sticks conversing with one another while others seek respite from the sun by drinking tea and soup under large canvas tents. Hundreds of camels and cattle lull about in the mud. The deep growl of the camel is almost comical, as they seem to mockingly grin at the frustrated herders trying to persuade these obstreperous ships of the desert to stand up. The Sudanese herder showed me his stall and invited me to have Sudanese tea. The people all struck me as quite hospitable and a number of people accosted me with an "ahlen" and shook my hand. They appeared to find it odd that a visitor would venture to such a remote place but seemed genuinely pleased to share their culture. Egypt was quite an experience, I look forward to returning one of these day to explore the rest of the country.